c) It has to cost less than $1500. 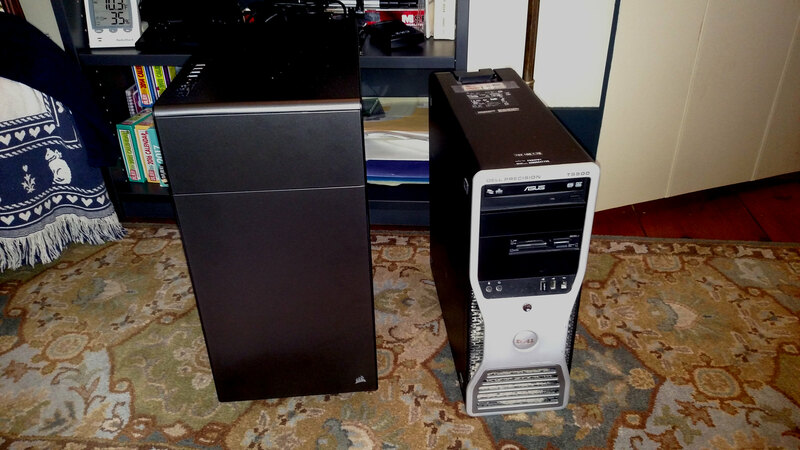 To the first point, my old PC is pretty good: a Dell Precision T5500 workstation upgraded to 36GB of RAM, 250GB SSD and dual w5590 Xeon processors which provide a total of 8 hyperthreaded cores (16 threads) at 3.33GHz. The video system is an older Radeon R7 260X, not a gaming card, but more than adequate to run my triple monitor setup. In the speed/cost department it was going to be hard to keep under budget if I wanted to stay with a lot of cores. I decided to go with an i7-7700K. That pretty much represents a knee in the processor performance curve, and with a CPUMark rating in excess of 12,000 it was twice as fast as a single w5590, so it puts me in the same ballpark as my old dual Xeon machine. Less cores, to be sure, but a much more modern CPU architecture that is amenable to overclocking. The motherboard was a tough decision. The MSI boards look like they have a more capable BIOS, but were more expensive than the EVGA boards. Both were good for potential overclocking. I went with the less expensive EVGA Z270FTW. It has dual GiGE, lots of USB 3.x and a whole host of other nice features. This is one area I'm not sure I made the right decision, but I'll never know unless I buy an MSI motherboard! I had wanted to upgrade to a 500GB SSD, and a 1TB hard drive for ancillary storage. However, when I saw that the EVGA motherboard had M.2 support, I knew I had to blow some money on a blazingly fast M.2 SSD. Alas, budget-wise that brought me back down to a 250GB SSD, and I threw in an old Seagate 500GB SATA drive I already had for ancillary storage. The M.2 SSD that I used is the very fast Samsung EVO 960. The RAM I was able to get used from a friend. Corsair Vengeance LPX DDR4 3200MHz, 16GB total. If I had had to buy the RAM, I would have cheaped out on the M.2 SSD and also the RAM, probably going with something slower, so that was a lucky find. The EVGA board does support up to 3600MHz RAM, BTW. To keep things quiet, and to support future overclocking efforts, I wanted liquid cooling for the CPU. I found a refurbished Corsair H115i cooler at Newegg for short money, so that was an easy decision. For video I again wanted something that would run 3 Displayport monitors, be reasonably fast but not necessarily an all out gaming machine, and be liquid cooled so that it would be nearly silent. I also wanted to get back to having an Nvidia chipset so that I could support CUDA processing in the future. I found a used EVGA 1070 Hybrid on eBay and snapped that right up. It's a pretty fast machine, but a real gamer would be sneering at it and asking why I hadn't got a 1080! For the power supply I splurged again and bought a near top of the line, EVGA Supernova 850, fully modular power supply. As it turns out, I probably shouldn't have spent that money, as I ultimately went over my cost target by about $100 with a few odds and ends I did not budget for. But it is a really great supply. At 850W it'll loaf along and almost never spin its fan, and it came with every cable I needed. The case is pretty amazing. I've never had a modern PC case before. I chose the Corsair 600Q because it is generally considered one of the quietest cases on the planet, and it would easily accept all of the liquid cooling provisions. It was a little more expensive than a non-acoustically insulated case. The Phanteks cases are nice and a little less expensive, albeit not as quiet. Where I went over budget is that I needed a slew of little things: a real serial port card, a USB 3.0 header, an internal USB hub (from NZXT) so I could control the CPU cooler (it is USB controlled), and of course a Win10Pro license. I got all that for about $100 total, and that pushed me almost exactly to $1600. - Passmark score of almost 7000. With overclocking I should be higher. That's a fast machine! - VAC audio is, finally, almost drop-out free. It does take some fussing with the settings. I could not achieve this on my old computer. - The computer is, overall, much faster. It boots in only a few seconds. Every program launches twice as fast. Video is much smoother. - It is nearly silent. My average CPU load is around 30% with everything running (PowerSDR, Pro Tools, OBS streaming, Chrome, etc.). The fans stay around 30% and CPU temp's stay in the 35C range. I could probably turn the fans down further. 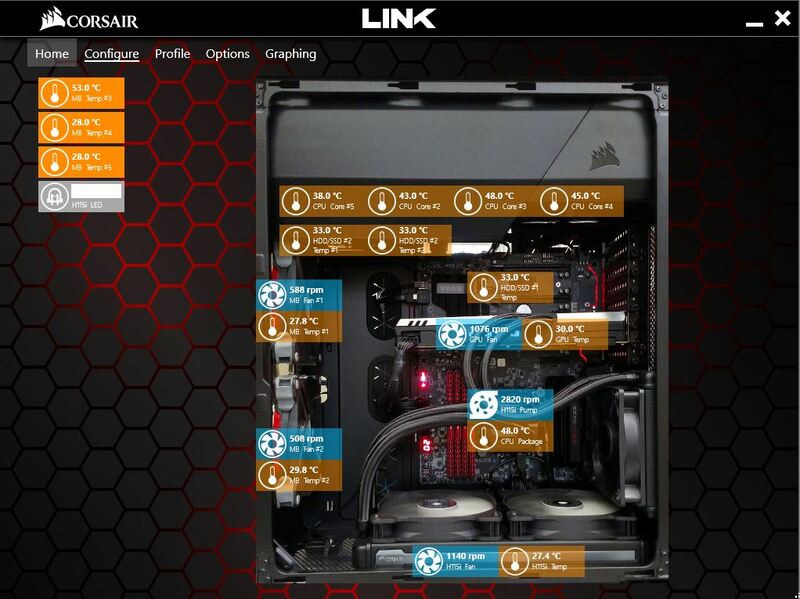 I can control all of this and customize fan curves from the desktop using the Corsair Link and EVGA Precision applications. The only slight surprise is my CPU loading has not gone down compared to the dual Xeons. As I wrote above, perhaps not a surprise, since the CPUmark of the 7700 is twice that of a single Xeon. The one disappointment is that the higher performing NIC on the motherboard, the "Killer" NIC, will not work with PowerSDR and the radio. This is a real mystery and one I intend to further investigate. For now I'm using the Intel NIC. I have included some photos below. Out with the old and in with the new, and the new is HUGE! Lots of space in these new cases! Great work Scott, looks great . I'd be interested if you ever find out what the issue was with the Killer NIC as I was thinking of investing in one. Just for information If you'd like to save some bucks, pay attention to AMD Ryzen. It's not necessary to buy fastest one 1800X, you can take 1700. On good MoBo it will OC with one kick to same performance or even bigger as 1800X on stock cooler. As well as with right memory modules you can reach 3200Mhz on it and got even higher performance. But if it will be computer exclusively for radio, then Ryzen 1600 should be enough. On other side, there are some problems around. Mostly with RAM. But a lot of modules work like a charm. It looks they will be solved soon with new microcode releases. Because platform are very new. Scott, nice build for sure! I'm having a bit of Passmark envy. I got an overall score on my Dream Machine of aprox. 5400. The CPU benchmark was 14k+ and the disk benchmark was 23k+ but I fell apart on the video scores. As you may remember, I went to the AMD FirePro 5100 to get rid of the latency issues I was having with the NVDIA 980 card. I always felt the 5100 was barely adequate although it did not cause me any driver/latency issues. I am also seeing numerous video glitches with that card and I'm am seeing an occasional black screen on one or the other monitor which tells me its a card rather than monitor or cable issue. Now, Passmark is telling me it stinks. I guess its time to upgrade the card. I hear you on the "video penalty". I took a big one myself because I don't have a 4K monitor, and Passmark penalizes for that quite significantly. 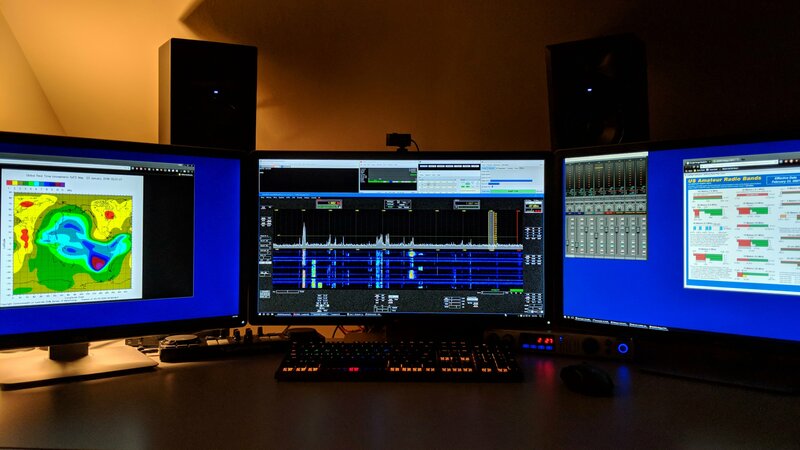 I need to figure out how to get Passmark to treat my triple monitors as a single monitor. Scott, any driver/latency issues with your NVIDIA card? Guessing not since you are indicating a reduction in the drops and pops department. As mentioned, I was pretty disappointed in the video performance of the FirePro 5100 as per Passmark. Probably shouldn't have been a surprise since I could actually notice the mediocre performance with my two eyes. 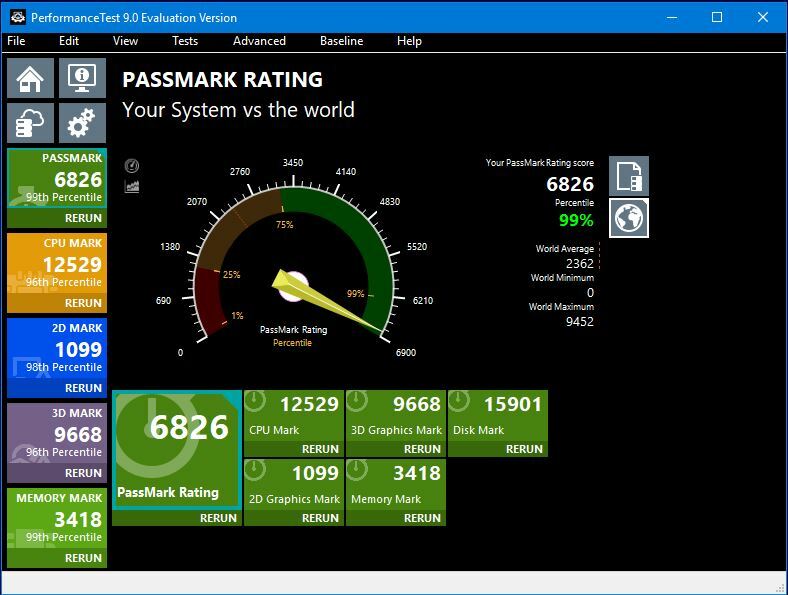 However, my card was actually running noticeably better than other 5100's in Passmark's comparative benchmarks. So was my RAM, but also sub-par. I went with LOTS of RAM but lower speed when I did my build. That was a mistake. 32 GB of 3200 performs much better than 128 GB of 2133. Windows doesn't actually use that much RAM but what it does use should be fast. So, anything over 64 GB is a pure waste of money. I am going to do something different for video for sure and may upgrade the RAM as well. If I can achieve a 14k+ CPU benchmark and a 23k+ benchmark on my disk (Samsung 500 GB SSD), then I'm leaving a lot of performance on the table on account of a cheapo video card and a RAM mistake. My build was a lot different than yours as I needed to rack mount the computer and its hard to find the space in server rack cases. I bought a 27 inch depth case and, as you can see, it is massive. 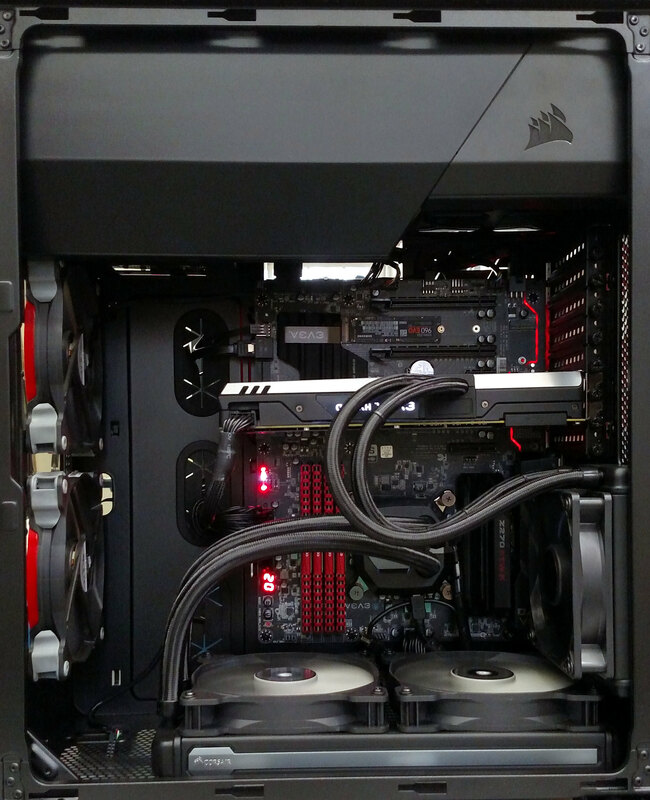 Still, its too cramped to get all of the Corsair H100i V2 water cooler inside the case. I had to mod it to separate the fans and mount them on the outside. I also noticed your video card appears to be water cooled? I had a bit of a pucker moment last night as I was tweaking the BIOS to see if I could improve my Passmark score. I inadvertently selected the wrong DRAM speed in the BIOS and thereafter the computer would not boot. Nothing. Black screen. Nothing would let me back into the BIOS. I figured a back-door work around today to get back into the BIOS and then reset everything, simplified some settings and BOOM, I was not only back in business but my Passmark score jumped by about 1k. Attached some pics. Station is being rebuilt and 8000 will sit on top of the computer. Again, not noticing any problems associated with the 1070 video card. Finding the optimum buffer settings was fussy, but doable. The video card is an EVGA GTX 1070 Hybrid liquid cooled card. Diggin' the rack slides on the PC. I hope you will use a rack shelf for the 8000 and not just plop it on top of the PC! In an attempt to get my Passmark score up, I put the triple displays into Nvidia "Surround" mode. That made a big difference, jumping my 3D graphics mark up by quite a bit, although I still took a substantial penalty for no 4K display More interestingly, the GPU physics test went amazingly faster, like crazy fast! Alas, I don't like how the display ergonomics work in that mode, so I changed it back, but it remains an option. I'm amazed at your 23K Diskmark. I have one of the fastest drives available, a 250GB Samsung 960 EVO NVME plugged into an M.2 socket. I need to figure out what I'm doing wrong! I am using Samsung Magician with the SSD and the CPU is an I7 Haswell. So, will be working on the video and RAM. I don't see any problem with the 8000 sitting on the computer. There is no heat under the unit and it is well supported by the case and a shelf under the computer which is rated at 250 pounds. Plus, I have a total of 72 RU's and have an Excel spreadsheet that says I will use 71.67 RU's. I ain't got the space for another shelf. Here's what it looks like so far. Ooh, I was unaware of Magician! And I see it supports "Rapid" mode RAM caching. I will have to try that! Thanks! After a month of using the new PC I am really enjoying it. It is quiet, steady, fast and reliable. I run the CPU pump at max. as it make no noise, and the other fans in their "quiet" preset, with the case fans set to 50% in the BIOS. CPU temp's run around 30C at idle, 40C when running my PowerSDR setup with digital audio workstation software and live streaming to the interweb. The only problem I haven't figured out yet is how to use the Killer NIC. The standard Killer NIC drivers won't work with the Apache Labs radios, so I'm using the Intel NIC right now. With a couple of weeks of good backups on the NAS, I've now started to play with overclocking. This is my first rodeo with overclocking, so really have no clue. Nevertheless, following some excellent internet recommendations, I just banged it up to 1.35V and 4800MHz. Performance was notably faster. Passmark at the stock 4200MHz was 6845. Passmark at 4800MHz was 7247. I stressed it for about an hour using x264 and temp's were steady in the 80's. I did not do a 24 hour test, but simply used the PC for about a week like that with no problems. At my normal CPU loads running the SDR/DAW/streaming, I see temp's averaging in the 50's. CPU cooler fan speed makes no difference. That might be because I'm inlet limited with the dual 140mm case fans running 50%. I haven't investigated that yet. Or perhaps the pump at max. is well handled by low CPU cooler fan speeds. I am seeing the i7-7700K temperature spiking issue, but they only spike up a little on mine, maybe 10 degrees occasionally. Throwing caution to the wind, I took it up to 5GHz this morning with the voltage still at 1.35V, as things were already hot enough for me. Again, an hour of the x264 stress tool. This time temp's went up to the low 90's. This is not something I would want to do for a long time, like if I was a gamer. But, since I'm not a gamer, I'm going to let it ride and see if things stay stable, because the SDR stuff doesn't really stress things very much. With PowerSDR, DAW and stream running (and a browser, of course) CPU load stays in the high 30's and temp's stay in the high 50's with occasional spikes to high 70's per the Core Temp app (stupid i7-7700 temp. spike issue!) This I am comfortable with if everything stays stable. So I'll run it like this for a week or so and then probably call it good. Did I say I was probably going to call it good? That 8000 milestone beckons! I really don't have the patience to shave away at CPU voltage all day or fuss with cache or memory overclocking. I could not run Samsung Magician. Maybe if Samsung comes out with a version of Magician that supports my 960 EVO M2 storage, or maybe if I overclock the GPU, which is running quite cool, I could eek out a bit more and push over into the 8000 range. I definitely do not have any plans for de-lidding the CPU! I'm not a fan of overclocking - I prefer stability over performance. So far the machine has been a rock at 5GHz under the conditions that I use it. Very speedy! If it were not, I would not use it this way. I don't like to stress hardware, it's bad enough with the bugs in the software. Nice PC - I'm using a Gainwood GTX 1070 Phoenix and run the fan at 25% minimum - reduces ambient temperature from 52C to 36C, stops heat wafting up into my RAM. CPU is i7-4770 which is water cooled. Scott, wow! You're killing me on the graphics score and substantially better on memory as well. I noticed your Corsair stats and thought to myself that my CPU cooling fans had been running wild lately and checked mine. Temps were out of control; some CPU cores were in the mid-60's. A bit of research suggested that I should pull the Corsair H100i V2 off the I7, clean the chip and cooler contact and re-grease them. Immediately, the fans ran down and the CPU cores were all running around 28-34 C, a bit higher when HPSDR is running. CPU loads also dropped, dramatically. Apparently, there are some liquid I7 compatible CPU coolers which you don't have to periodically re-grease, but mine isn't one of them. I should try some overclocking. My CPU voltage is a modest .95 v and my memory is running at half speed (1066.5 mHz). My Passmark score edged up by around 200 when I fixed the cooling issue. However, nothing is going to fix my ridiculously slow GPU (which is also running glitchy). That will get an upgrade shortly. Sorry to hear the Killer NIC's are still an issue. Like you, I did read that the generic Qualcom drivers work better. Have you tried that yet? I wouldn't say they are a huge issue, I just haven't motivated to solve the problem yet. I did also read about the Qualcomm drivers. Wow, I guess Scott had the need for speed. I finally have the Ryzen 7 going under Windows 10. The M2 is a 500GB as a main drive. I have 32GB of memory with a GTX 1060 6GB video card. I have not done any overclocking but I thought I would test this for grins and giggles. I got a PassMark Rating of 3497. That puts it at 77 percent. My other machine I have been using for logging and rig control is at 892 and for percentile it just laughs. About the GPU (graphics card) - this is important when the software used OpenGL or DirectX graphics, programs such a PowerSDR, SDR# etc. don't, also a NVIDIA GPU can be used for FFT processing. 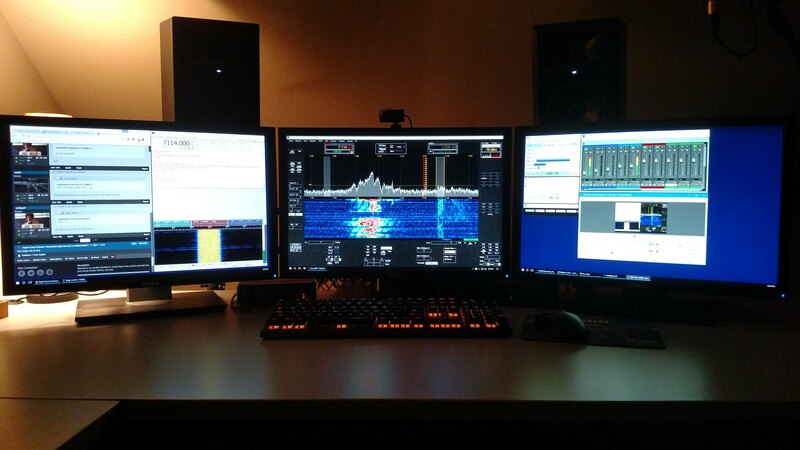 As far as I know, V3 of my own software is the only common SDR console using the GPU for graphics. I'd be interested to know what the CPUMark was for the Ryzen? Good lord, Larry. What are you using for CPU cooling? Oh, that's only 34C. A totally normal and unremarkable idling temperature for a CPU. Nothing to worry about there! One thing I do with new PCs is run one of the many utilities which sets the CPU to 100% load for ten minutes, this way you see how good the cooling really is. My default for CPU cooling is water, GPU is fans but the fans always run, even if at just 25%. It's now been a little over 6 months since I built my PC. Recently I started to have frequent blue screens. By the way, if you have never used Windows Reliability Monitor, this little known built-in feature of Windows is really great. There are a variety of dump file analysis tools that you can download also. These will help translate those obscure error codes into plain English. Anyhow, the error codes on the blue screen dumps were all hardware related, which is a flare-lit tip-off that my overclocking is too aggressive. I was running at 5GHz. I backed that off to 4.8GHz and now the system has been ROCK solid for a month. I can't believe it's time to re-apply thermal compound, but a bit of degradation in the thermal performance of the build is the only thing I can think of that might be responsible for this. I think I'll wait on this, and until and unless this starts happening again and I have to back off the clock rate further, I'm going to be lazy and not worry about it. Got the deal of the century off of Craigslist: triple Dell P2815Q 4K monitors. The EVGA 1070ti runs them just fine. Blew some money on a next level sound interface, a Presonus Studio 192 Mobile. Got the tiny Hercules DJControl Compact. It's great, it has just enough buttons and wheels, and fits under the monitors when I don't want it. As I wrote in another part of this forum, I rarely have the same setup more than a month or two before I'm rebuilding, because then I've come up with another solution that may be of both major or minor nature. Posting a picture when it's ready for this time. I don’t suffer from insanity, I enjoy every second of it! Very nice, Scott. I love the colors, subdued lighting and overall clean look. 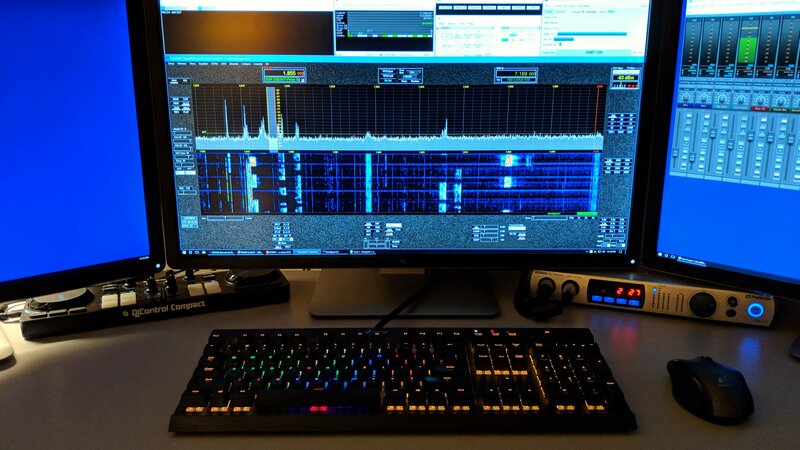 4k monitors are the bomb, particularly the Dells. I recently did what I thought was a small rebuild; really a relocation of the main computer and addition of a solid state amp. I moved the computer to the small (audio) rack) from the big (RF) rack. As usual, that turned out to be much more complicated than I expected. Once complete, I had some random black screens on my Dell 4k's. Nothing really changed except I added some DP extension cables. I juggled things and determined that the original cables yielded the same problem. I updated drivers, swapped monitors, everything I could think of and nothing worked. I Googled the issue and found no useful info. I then Googled the specific monitor model number and "black screen" and found an obscure note on the Dell support site that informed me that there are two different DP protocols available in the monitor setup, in a deep menu that I did not know existed. I changed the protocol and the black screens ceased. My graphics card supposedly supports both protocols but, after the computer move, it did not. No logical explanation for this. I pass this on in case someone else runs into this issue with DP connections.